Hamastan. A few hangings and some tough challenges for the BBC reporter. The Hamas-controlled administration in Gaza has announced that three prisoners have been executed. The Gaza interior ministry says the men were hanged at what it called a security centre in Gaza City. One of the men was accused of collaborating with Israel and the others had been found guilty of murder. Mmm. The BBC’s Middle East correspondent Kevin Connolly says it is impossible to assess the quality of the evidence presented against the three men who have been executed. True, however it is possible to assess the savagery of such actions. It is possible to ask where is the UN and EU and Quartet response or at least it should be since that is the case when Israel does anything controversial in BBC eyes. I’ll be honest and state my own prejudice. I am pleased that Gilad Shalit is being freed today but I TOTALLY oppose the swap on the simple principle that rewarding terrorism usually ensures you get more of it. But it’s a big day for Israel and also for Hamastan. I was surprised to hear the BBC refer to Shalit’s five year incarceration as “detention” this morning. Detention, eh? Even after all these years they just cannot bring themselves to admit that Shalit was kidnapped and then held hostage by Hamastan. Nor do they mention that two of Shalit’s colleagues were murdered by the same loathsome Hamas killers. The BBC also seems a bit coy about the nature of those Palestinian “fighters” being released, almost as if their convictions for terrorism against Israel has no meaning. Similarly, the comment “Those released will return to armed struggle. It is a great national achievement.” by Khaled Mashal, Chairman, Hamas Political Bureau, Damascus, Syria, seems to have been missed by the world class BBC. The BBC will record the jubilation amongst Palestinians as they celebrate their hatred of Israel and yet I suggest it will do everything possible to sanitise the blood lust on display, I will leave it to you to determine why. WE ARE ALL HIZBOLLAH NOW? Do you recall the very sympathetic treatment the BBC gave those loutish trash who used the Israeli defence actions against Hezbollah in Lebanon to trail through the streets of London and proclaim that “We are all Hezbollah now”? Funny how the BBC are subdued on the news that Hezbollah and Hamas are supplying thugs to put down the insurrection against the Mullah’s? Cat got their tongue?? Comments Off on THE LANGUAGE OF HAMAS. BBC reporter Paul Reynolds, he who is oft mentioned on this pages, has a new article here on what he calls “the language of Hamas.” I think he makes some fair enough points re Hamas though I suggest to Paul that Hamas do not want a final settlement with Israel, they seek a final solution. Like Hitler. Your thoughts? 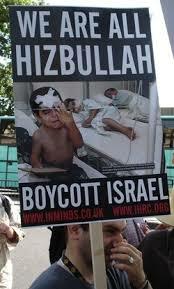 Visceral BBC prejudice against Israel will constitute a full chapter to itself in the forthcoming book on BBC bias. As Israel continues to righteously take out Hamas terror infrastructure, the BBC is naturally giving Pallywood every opportunity to portray itself, and its rocketeers of course, as victims. Their only crime is to be, erm, Jihadists. So I thought I might open up this thread for you to detail some of the worst excesses you are bound to come across as the BBC rallies around Hamastan. Just as well Harold Pinter is dead, he would be so upset to discover Israel is still capable of defending itself. Been away for a few days folks so just trying to catch up on the news! I see that Hamas, those nice people for whom the BBC carries such a candle, have decided to declare open season on Israel just in time for Christmas. As the BBC puts it, “The Egyptian-brokered deal began on 19 June but has been tested regularly by Palestinian rocket attacks on Israel and Israeli operations in Gaza. ” Just wondering why the BBC equates Hamas terror attacks with Israeli efforts to, erm, prevent rocket attacks. Testing indeed.
. I see that Palestinian terrorists are continuing to fire rockets into Israel, one week into the much vaunted “truce.” I was intrigued to read this BBC report which states that the al-Aqsa Martyrs Brigade said they fired the rocket, which fell harmlessly, to retaliate for alleged Israeli violations of the truce. Subtle, eh? OK so the Palis did FIRE a rocket or two but they were harmless and anyway those pesky Jews had violated the “truce” so retaliation was only to be expected, right? Why is the BBC so relentlessly pro-Palestinian no matter how blatant the savagery from Al Aqsa and Hamas? Notice the way in which the BBC gives Hamas claims priority in this story. You will recall that BBC reporter Alan Johnston was kidnapped by Palestinian terrorists in the Hamas stronghold of Gaza. He was held captive for four months and then released as an act of “goodwill” by the deranged Palestinian killers – a group that the British government had been in “dialogue” with leading up to his release. The question NOW being asked if the release from prison this week of Abu Qatada – a radical Islamic cleric once described as Osama bin Laden’s right-hand man in Europe – part of a deal that Britain made with Gaza-based terrorists for the freedom BBC reporter Alan Johnston? Speaking from jail last summer, Abu Qatada himself offered to help mediate the prisoner exchange. Hamas sources and Israeli diplomatic sources familiar with the Johnston release talks confirmed to WND last summer there were third-party discussions between Gaza’s Hamas rulers, a mediator and the British government for the release of Johnston. A second track of negotiations were opened between Hamas and the Army of Islam kidnappers, the sources said. Also, the BBC was in direct contact with Hamas, said the sources. Palestinian sources involved in the Johnston negotiations said Hamas passed to the British government the Army of Islam’s demand for the freedom of Abu Qatada. They also warned if Hamas stormed the Gaza compound in which Johnston was known to have been held, the BBC reporter likely would have been killed during any rescue attempt. Abu Oubaida, a spokesman for Hamas, would not confirm any deal was reached. The British embassy in Tel Aviv did not return calls for comment on the issue. Officials from Palestinian Authority President Mahmoud Abbas’ office said they believe a deal was made for the release of Johnston. They also accused Hamas of paying off the Army of Islam. So, is it possible that the British government and the BBC have colluded to engineer the release of a BBC journalist by doing a shoddy deal that gets an alleged Islamic terrorist mastermind a “get out of jail free” card? I think we should be told, don’t you? Can we trust the BBC to tell us? I’m sure you will all have noticed the blazing BBC headline “Israel has 15o nuclear weapons”. Or at least so says Hamas’s best pal and America’s worst ever President Dhimmi Carter. Carter is soooo on-message for Al Beeb, you can just see the Beeboids drooling when Carter gibbers that Israeli treatment of Palestinians is “one of the greatest human rights crimes on earth”. Any chance to bash the Jews, eh? When you consider the sympathetic hearing that the Mad Mullahs in Tehran get, the endless apologising for the Palestinian savages in Hamas, and the propagandising for Hezbollah, it’s no surprise that the anti-Semitic ravings of Carter get blown up to nuclear proportions by the BBC .
. It’s Friday and the BBC as ever is running a series of stories aimed at undermining the image of Israel. First up, at 6.55am on the Today programme we had an item on the “Investment conference” for the West Bank and Gaza. (Judea and Samaria) The key theme here was that these were great places to invest (!!!) but that the fact that those pesky Jews have such strict border restrictions in place does make such financial investment so much more difficult. Not a mention WHY Israel needs to have such strict security arrangements and not a mention of the fact that the savages in Hamas (My apologies to those tender souls who may object to me labelling Hamas as such but there you go, it’s accurate) have given Israel no choice in this matter whatsoever. Throughout it’s coverage of this region, the BBC consistently downplays the atrocious behaviour of the Palestinians who wallow in their own depravity. Then, having shilled for Hamas, the BBC runs a news item entitled “Blair jet faced Israeli warplanes”. My god, isn’t it bad enough that Israel denies Hamas the right to slaughter its citizens without confronting Mr Blair at 35,000 feet? Turns out that the story reduces to the fact that the jet carrying the former great leader failed to identify itself as it crossed Israeli air space. A better headline might have been “Israeli jets confront unidentified aircraft” but then why miss a chance to imply how aggrssive the Israelis are? Don’t know about you but I find that trying to get any balanced news from the BBC on Israel is pretty much impossible. I see that Hamas terrorists have killed an innocent Israeli man by another indiscriminate mortar attack so favoured by these savages, sorry I meant oppressed militants, right? But just reflect on the way the BBC reports this killing..
Wonder did anybody catch John Humphrys interviewing the spokesman for the Israeli government on the Today programme early this morning? Talk about a visceral dislike! In essence Humphrys interview was sheer shilling for the Hamas hudna, and he seemed determined to try and get the Israeli government spokesman to say that if Hamas stopped firing rockets – for even a few days – then Israel would respond by lifting the current blockade of Gaza. Not a mention of the overnight murder of two Israelis by “militants” from Humphrys. No, Hamas were being given the kid gloves treatment whilst Israel was being roughed up. I thought his interview was shallow, biased, and had an atmosphere about it that was downright unpleasant. As it happens, I think John Humphrys is a very good interviewer but when he is talking to someone representing Israel, his standards appear to fall – as they most certainly did this morning. What IS IT about Israel that so offends the Beeboids? Comments Off on THE JEWISH NAZIS. One of the greatest moral obscenities of these times is the way in which those who despise Israel try to compare it to the Nazi regime. The BBC reports that a UN Security Council Meeting to discuss the “humanitarian crisis” in Gaza was halted when the Libyan ambassador likened Gaza to a Nazi death camp. So far, no surprises – and the irony of having a Libyan seated on the UN Security Council goes without comment. But if you wade through this BBC report which plays up for all it is worth the dire state facing Gazans, you will go a long way before the obligatory sentence is stuck in explaining WHY fuel supplies are restricted. In BBC-speak it’s because Israel is seeking to “force” the “Islamic movement” Hamas to stop rocket fire into Israel. In the language of any normal person, it is to stop Islamic terrorists trying to murder innocent Israelis. The UN, the EU and its propagandist mouthpieces like the BBC all try to obsfucate this fundamental truth, and do their best to portray Israel as the aggressor when in fact it is only defending the lives of its own citizens. The folly of Gazans in voting in a terror regime is never raised by the BBC and the savages in Hamas are presented as if they were some sort of model democratic government. Maybe the BBC thinks it is?
. We all know just how oppressed those poor Palestinians that inhabit Gaza are. Why the BBC’s Aleem Maqbool bemoans that “Peace talks fail to hearten Gazans.” Funny how the BBC seems to have missed reporting what DOES hearten Gazans. Can you guess what it is? Yes, that’s right – suicide bombing missions against those pesky Jews. It seems the majority of Gazans both support and relish that – but Aleem has nothing to say about that. Who’s surprised?